Celebrate March by greening up your drink habits! This month try switching out your coffee or soda for green tea. You can drink it hot or cold, depending on the weather Las Vegas decides to throw at us. And as a bonus, you can use the steeped tea bags to reduce under eye dark circles and puffiness. Green tea has been consumed and lauded for its health benefits for centuries. It is made from un-oxidized tea leaves and is one of the least processed types of tea. Modern science has begun to show us what those ancient peoples knew; green tea is all around amazing. 1. Because of its minimal processing, green tea contains high levels of antioxidants and beneficial bioactive compounds, such as polyphenols. These compounds help rid your body of free radicals, which are known to play a part in the aging process and the formation of disease. 2. 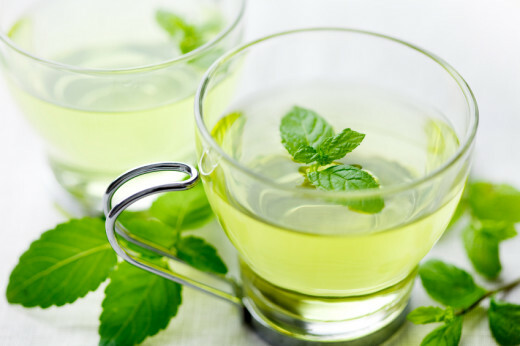 While green tea contains less caffeine than coffee, it also contains the amino acid L-theanine, which works together with caffeine to improve brain function. So you get a healthy brain boost, not the jitters and then a caffeine crash. 3. Green tea has antibacterial and anti-inflammatory properties, and is therefore helpful in preventing dental cavities, stress, chronic fatigue, and helps treat skin conditions and arthritis. 4. Green tea may help protect you against cancer. Multiple studies have shown that green tea drinkers have a lower risk of various types of cancer. 5. The catechins (antioxidants) in green tea can have a protective effect on neurons and may reduce the risk of both Alzheimer’s and Parkinson’s diseases. 6. Green tea has been shown to improve blood flow, lower cholesterol and help prevent heart disease. 7. Amino acids found in green tea reduce stress and provide a feelming of calm. * Don’t add green tea to boiling water, that will destroy some of the catechins. Instead try to steep in 160 to 170 degree water. * Add lemon. Vitamin C makes the healthy compounds in green tea easier to absorb. * Levels of the healthful compounds in green tea can vary. High end teas usually have more, and canned green tea drinks generally have less. Looking for one more way to add green tea to your life? Request our Rhonda Allison March Special Green Facial. Schedule your appointment with us today, or call for a consultation on any of our treatments.